EqualizerPro is a unique product that lets you enhance the audio on your PC, no matter what program you are using. If you listen to music, watch movies, play games, or do anything else that produces sound on your computer you will benefit from this product. EqualizerPro works off your Windows operating system so it’s compatible with any program you may be using - iTunes, Spotify, YouTube, Pandora, Skype, etc... Some programs have built in sound equalizers that you can use but that means that you have to individually adjust each one. 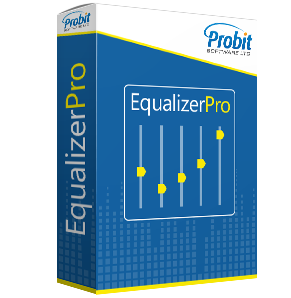 EqualizerPro works with all your music programs so you won’t need any other equalizer. It’s an easy-to-use graphic equalizer and has many features designed to help you achieve the best sound for your needs. This includes features like a 10 band equalizer, over 20 presets and you can easily create custom presets. You don’t have to spend thousands on expensive speakers or worry about buying the perfect headphones. EqualizerPro is the solution that will help you achieve the perfect sound. This is the ultimate sound enhancement tool. You’ve probably been dealing with mediocre sound on your PC for so long that you’ve forgotten how good it can sound. You deserve to watch that movie, or listen to music at the highest quality possible. Open yourself to a whole new world of sound!